This stop animation was commissioned by State Radio as their first music video. Their song Rash of Robberies is about the lead singer's grandfather, who slowly loses his memory to dementia. The locations in the video are all places that his grandfather spent time and the large black dog running through the entire peice represents the dementia that begins to destroy his memories, burning everything in its path. In Hong Kong older neighborhoods are under the constant threat of being replaced by skyscrapers. Buildings from the 1940s and 50s are rapidly disappearing and the communities that have occupied them for generations face eviction and relocation. We found that in one such neighborhood a dozen shop owners were still holding out against government seizure. They recognized the futility of saving every building on the block so they were proposing a plan to the government to condense several buildings worth of shops into one living history museum. With these shop owners and local activists we planned a peaceful protest to bring awareness to their situation and proposal. On the buidling that the community hoped to save we drew representations of the shops that would live in each storefront (a magazine shop, a daycare center, a video game shop) to show the potential that those spaces represented. We also covered the entire block in duct tape flowers which the entire community created over the course of the previous week. 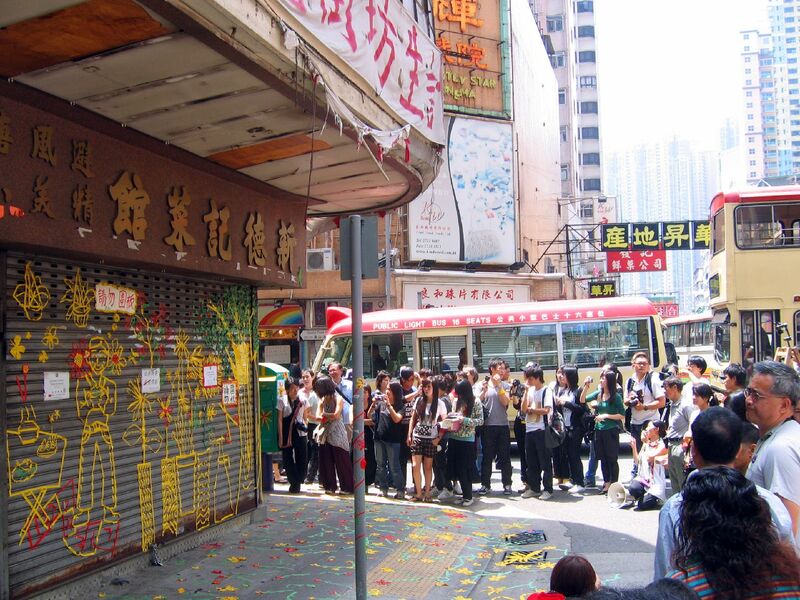 The protest was successful in garnering press for the proposal, however when we returned to Hong Kong in 2013 we found that ultimately the buildings did not escape leveling. While skyscrapers may have been inevitable, at least that community did not disappear without being heard. The Hong Kong Blossoms project reminded the rest of the city that they were still there.